It is hard to believe, but if the weather forecast stays true then we will have a whole weekend without gale force winds and rain. I am sure for many of you this will be the first opportunity that you have had in ages to get out fishing. Chesil will be on a lot of anglers minds, but I am not sure that I would bother traveling a couple of hours to fish a beach that generally doesn’t fish that well during January. I managed to get out in a break in the weather on Wednesday. Conditions were pretty good with heavily coloured water and reasonable winds. I made the long walk to Dragons Teeth at Abbotsbury, which reminded me why I don’t fish there very often. 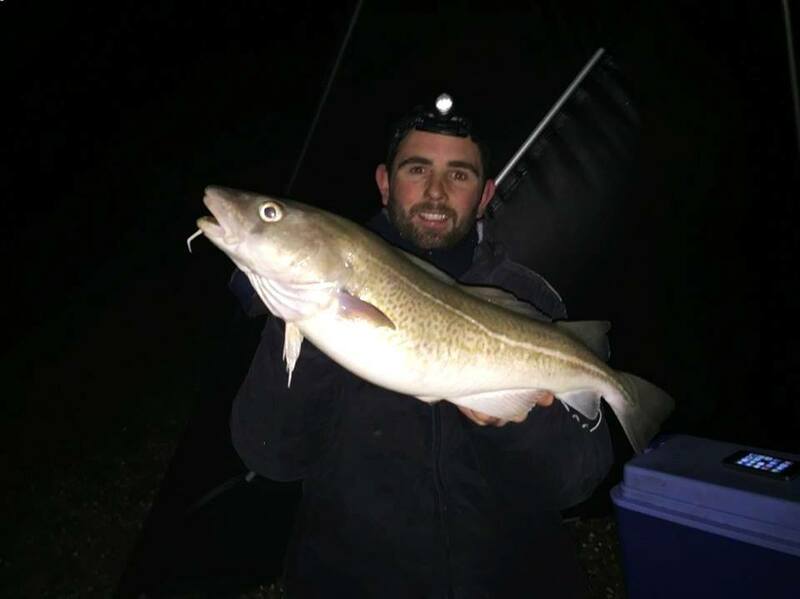 I was not expecting too much in the way of Cod, but I was confident of getting Whiting and having some sport with Dogfish and Pout on a light set up. Like most anglers I am eternally optimistic that a large Cod or Bass might be out there, so I set up one rod with a large Squid and Lugworm bait. It just so happened that there was a large Cod out there, 12lb to be exact, but unfortunately I wasn’t my bait that it fell too. It came to an angler about 400yds down the beach on a mark that I often fish, which made the long walk back all the less palatable. It wasn’t the only Cod caught this week! Danny Hardwick decided to rough it out on Tuesday night whilst the wind was still blowing hard. His first cast wouldn’t hold bottom with a 6oz breakaway. Being a good angler he used an elastic band to secure the legs on his weight, turning it into a fixed grip weight. That obviously worked as on his second cast he managed this lovely 5lb 5oz. Codling. It didn’t end there for Danny, as he had a steady stream of fish for the remainder of his session including Bass, Whiting, another Codling and a big Pout of 1lb 8oz. Chesil Beach forecast: I would avoid Chesil today unless you are a decent caster. Conditions are tough to say the least, but with the wind dropping overnight, it looks like Saturday and Sunday will be good. As I mentioned earlier, don’t expect any Cod, but there should be loads of Whiting, Pout and Dogfish, as well as Conger Eels. Best baits will be Peeler Crab, Lugworm and Squid. Mackerel will take Whiting, but you will get plagued with Dogfish if you use it. Portland: I am hoping that the water will have cleared enough on Sunday to allow me to go Wrasse fishing. The chances are it wont have done and if thats the case the only thing worth going for on Portland will be Conger’s. 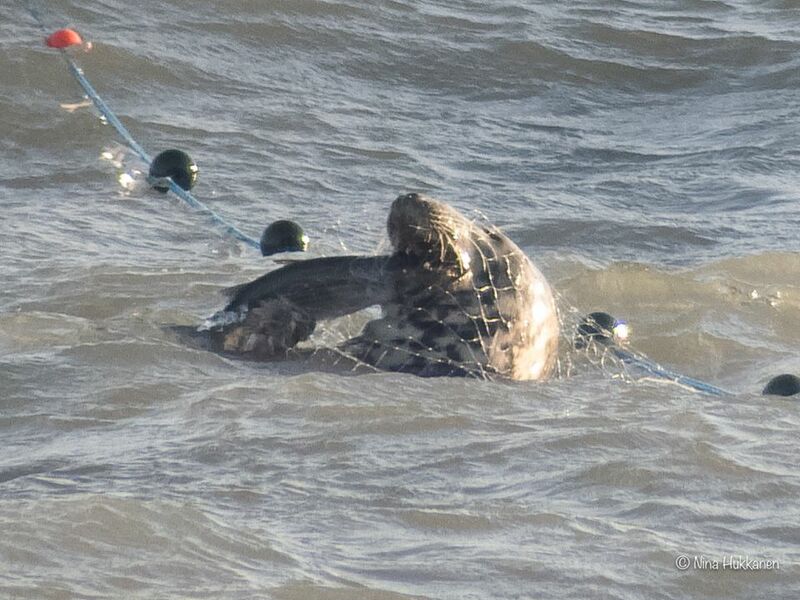 I did see some pictures this week from a local diver and photographer Izzy Imset, that showed a Seal stealing Mullet from nets placed around Portland Bill. 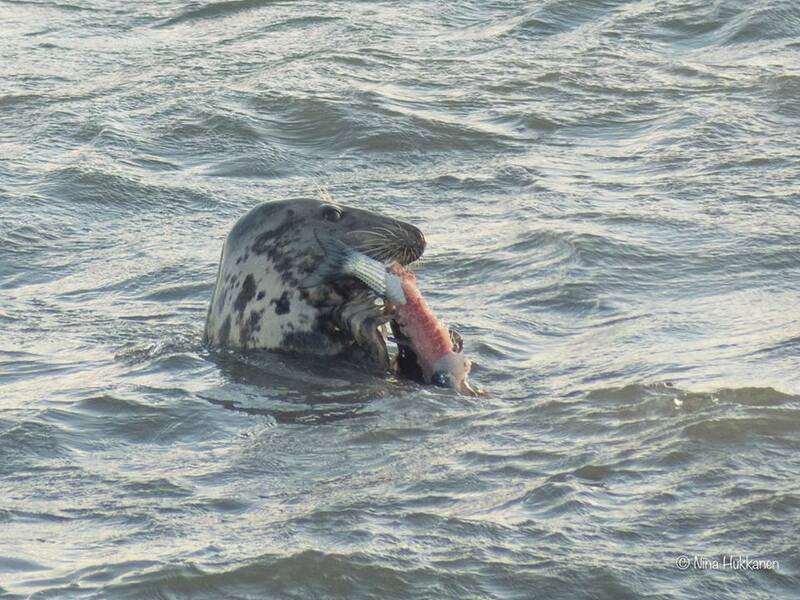 The Seal had at least half a dozen decent sized Mullet from the net. It makes you wonder if that is where the Mullet go during the winter. There was a lot of bird activity in the same area, which may indicate that the Bass are still there and hitting the shoals of baitfish. Portland Harbour: Plenty of FLounder still in the harbour, but it looks like the Bass have gone. If I get time this weekend I am going to try jigging for Flounder using mini jigs and Bucktail lures. This is something that I have seen anglers in America do with great success. I will let you know how I get on. 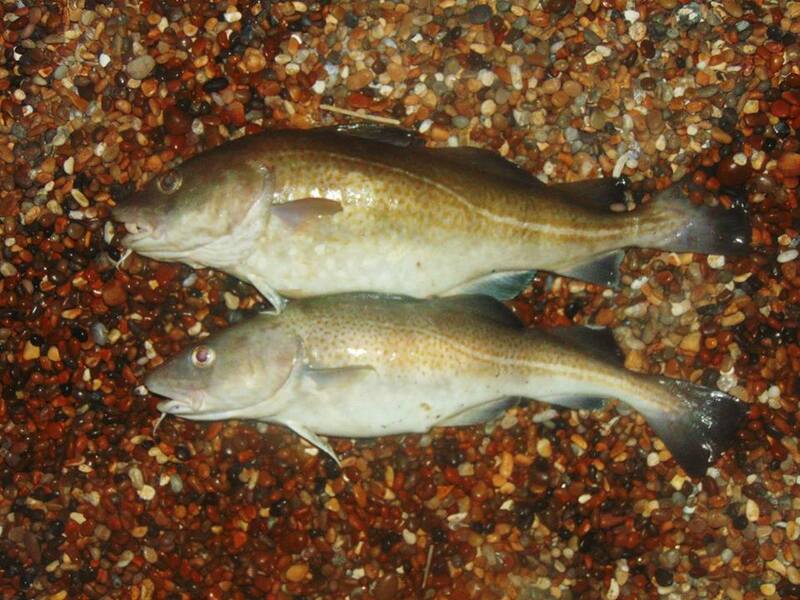 Weymouth Bay: Both piers will provide easy fishing this weekend, with a good chance of a FLounder. If the water clears enough then there may still be Wrasse around the piers as well. Preston continues to fish for Flounder and Dabs.